After an hour of just throwing the football, Trenton Miller felt something he hadn’t felt in a long time. He felt like himself. It was a moment where he embraced a passion that looked like it may have been lost to him and a decision that seemed impossible just a few short months ago. Miller decided he wasn’t done done as a football player. On Feb. 21, Miller announced that he had signed his first professional contract and would be heading overseas to join the Munich Cowboys of the German Football League. Miller’s once promising chances at a professional career looked to have been completely dashed. A dangerous hit to the head during a game against the Laval Rouge et Or, in September 2017 appeared to have ended the career of one of Concordia’s most distinguished athletes of the last decade. According to Miller, his medical situation is improving. 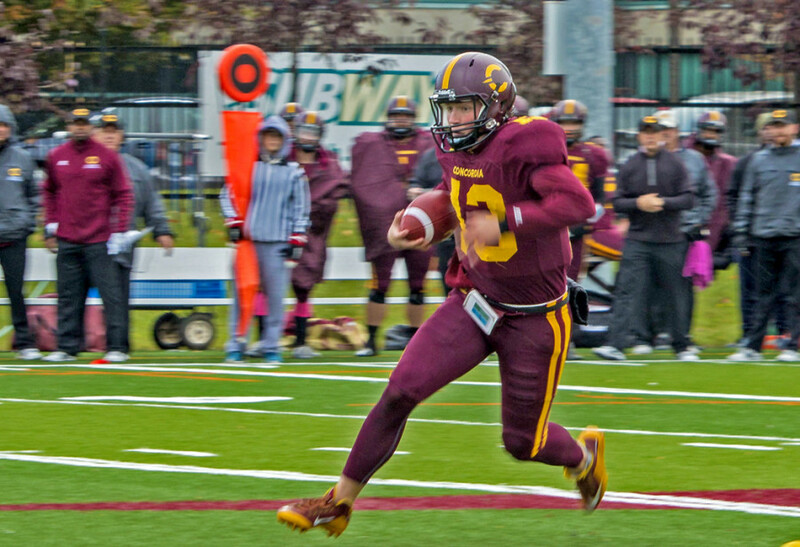 The former Stingers quarterback explained that the specialists he worked with had been erring on the side of caution in not reinstating him to play earlier. Miller says that recent results of functional MRI tests yielded “above average test scores” and led doctors to determine that he was in good enough shape to get back to football. What really struck the Munich-bound signal caller was that doctors informed him that he would be at no greater risk of concussion than any other player on the field. One conversation with his family and another with his new team was all both sides needed to decide Miller would become a Cowboy. It was a major turnaround for the 2015 Réseau du sport étudiant du Québec MVP. Within a week, he found himself not only announcing his first pro deal but getting engaged and making plans to move to a new continent. While he was enjoying his new job in pharmaceutical sales in Florida and contemplating an eventual turn to coaching, this new turn in his life brought a sense of excitement that he felt had been missing. It’s not just Miller that’s excited for his move to Germany. Cowboys head coach Garren Holley is looking forward to working with the former Stinger. “We were ready to offer a couple of other QB’s [when I] came across Trenton’s profile and finally had that feeling of ‘this is the guy we want to lead our team’,” said Holley. “I don’t speak any German but my lineage is German so my parents thought that was cool,” said Miller. While he is nervous, the Buffalo, New York native has successfully been through something like this before. “I loved that experience so much that I figure if I do something similar hopefully I’ll like it as much as going to Montreal,” he added. Luckily for Miller, he won’t be heading into his new league alone. He’s spent the last few weeks training with running back Darrell Lynn Tate. Tate signed his own contract with Munich back in October and has spent last season in the league’s second division. He also earned himself MVP titles in both that league and the Hungarian Football League. When coach Holley introduced Tate to Miller, the two realized that they were both training in the Tampa area and immediately set to learning their new playbook and building chemistry before the season starts on April 9. Related: Trenton Miller Signs First Professional Contract. Tate has been imparting some of his knowledge of Germany’s league to his new QB, explaining what life will be like in the GFL. Munich may be a new city and the GFL a new league, but it’s back to the kind of football Miller grew up with. The American style isn’t what he’s played the last few years in U Sports but he’s ready to slip right back into it. “I think it’ll be like riding a bike,” said Miller. He’s already noticed the difference that playing in the Canadian system while at Concordia has made. For one thing, his arm strength grew by leaps and bounds playing on the larger Canadian fields. Now it’ll just a matter of shaking off the rust. “I can already tell that he’s physically in shape and talent-wise, he’s ready,” said Tate who runs an overseas scouting company in addition to playing pro football. His company, Pro Hunt, helps players from college to semi-pro leagues and even high school find careers outside of North America. Tate’s new coach echoed his sentiments on the team’s new QB. “I feel he brings great leadership and talent. His versatility and arm strength are very impressive” said coach Holley, stressing how much Miller’s ability to adapt to both American and Canadian styles adds to his game. Miller will certainly be a welcome addition for the Cowboys after a difficult 2017 season. The team went 3-11 over the 14 game season and are obviously looking to get back on their feet moving forward with a new starting QB. “It was sort of a hallelujah moment when we found out Trenton signed,” said Tate. To prepare, he’s been training with accomplished college and pro players like former University of South Carolina Gamecocks quarterback Stephen Garcia. Working with these players has reminded Miller just how good he is and why he garnered so much interest from professional teams this year. With everything that’s happened after his injury, some are surely counting Miller out already. That’s nothing new for the QB, who is heading to Germany with something to prove.